So, I got all ready for this shoot, but when I had talked to the photographer weeks ago about the shoot, it was estimated to be about 14 degrees that day. Turned out, it was -1º… (“feels like -15º”!!!) 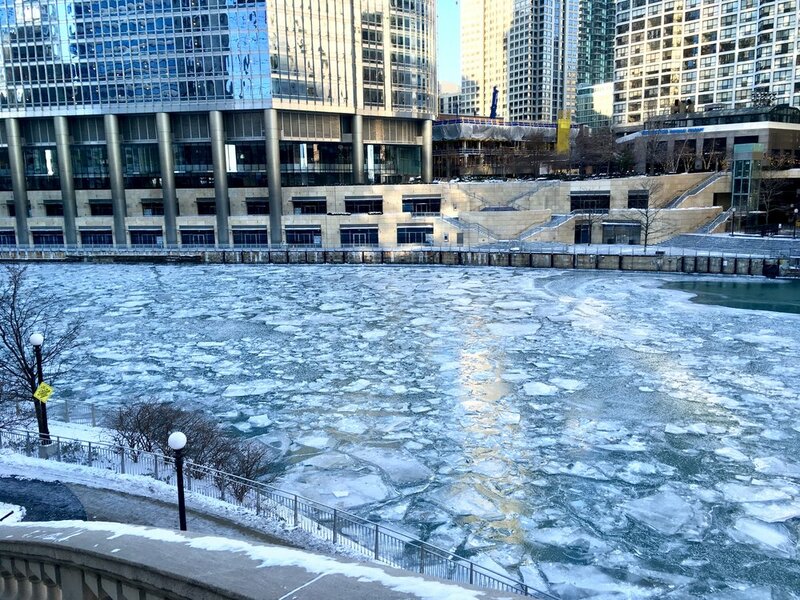 As Bart and I were walking to the meeting spot, Chicago's River Walk, I kept thinking “what is this photographer thinking shooting in this weather? !” I couldn’t feel my face…actually, I could…it just hurt so bad! We got to the River Walk, and it was so beautiful. The river was frozen…which is something I had never seen before. We met the photographer, and he got right to it…thank God, cause it was freeeeeezing!! He had already scouted the location and knew exactly where he wanted me to stand, and what type of shots, etc. He started getting some shots in, of me with the city behind me, had me turn around and look out at the city, had Bart come step in for a couple, and shot a few more of me. I turned around, and there was Bart…on his knee…holding a beautiful red box, with something super shiny in it…I couldn’t see specifics…just Bart. I went through about 100 different thoughts and emotions in seconds. I just stared at Bart, with a huge smile on my face…and then the tears came. "Look how handsome he looks!" We stood up, I took my gloves off, and finally got a good look at the ring. A 6-prong gorgeous diamond solitaire on a beautiful white gold band. Exactly what I would've picked myself! He slipped the ring on my finger, and I remembered we were in the middle of a “photo shoot”. Bart had hired the photographer (his friend) to fly out to Chicago, and set up a fake photo shoot, to capture this perfect surprise moment. In doing this, he was able to have me dress nicely (as nice as you can dress in “feels like -15º weather), have my makeup and hair done, get the proposal moment on camera, and make it all a total surprise. I am still in shock, and cannot believe that I get to spend the rest of my life with this man who constantly surprises me (which is kind of hard to do...although Bart will disagree), and loves me so unconditionally. Engagement (ahh!!) Pictures will be up soon...But here's a teaser! He had set up this whole “photo shoot” and hired his friend to come capture the best moment of my life! I started crying…asked him “what are you doing? !”, (at least a couple times)…he asked me to marry him…and I said YES!! 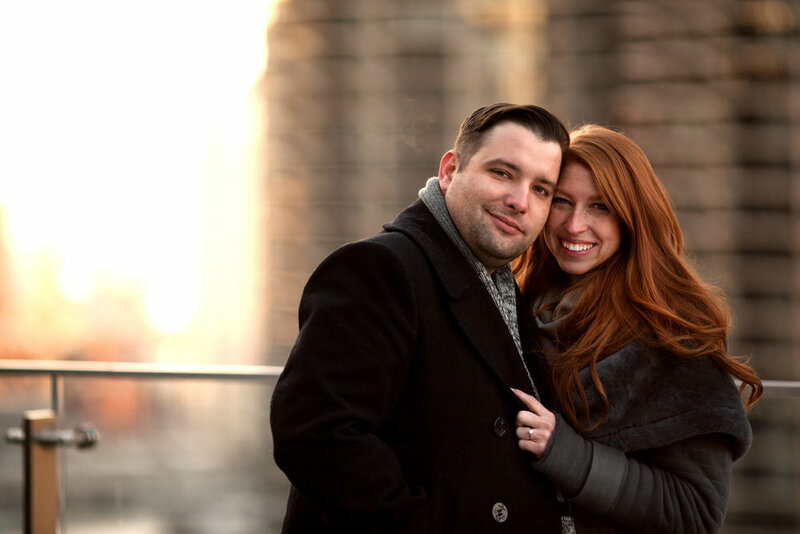 If you need a surprise engagement photographer, check out Taylor Mickal. He travels too...obvi!